Is Puerto Rico going to default? It's not all fun and sunshine on Puerto Rico's beaches this summer. The U.S. territory issued a lot of debt. Now creditors want to be paid, but there are concerns about whether Puerto Rico will honor its obligations. On Tuesday, Moody's knocked Puerto Rico's credit rating three notches further into junk status after the territory signed a law that makes it easier for some agencies to shirk debt payments. The law's passage again raised fears that Puerto Rico, still groaning under roughly $70 billion in debt, is inching closer to default. General obligation debt is supposed to be fenced-off from any lower-level restructuring efforts, but the market isn't buying that. "Puerto Rico's new law marks the end of the commonwealth's long history of taking actions needed to support its debt," Moody's said in its report. The downgrade is the latest slap on Puerto Rico, and it comes just six months after Moody's stripped the territory of investment grade status. All of this is akin to a flashing red light warning investors, and it will make it more difficult for Puerto Rico to raise money in the future. Most people don't pay attention to disputes between credits and debtors, but Puerto Rico is different. 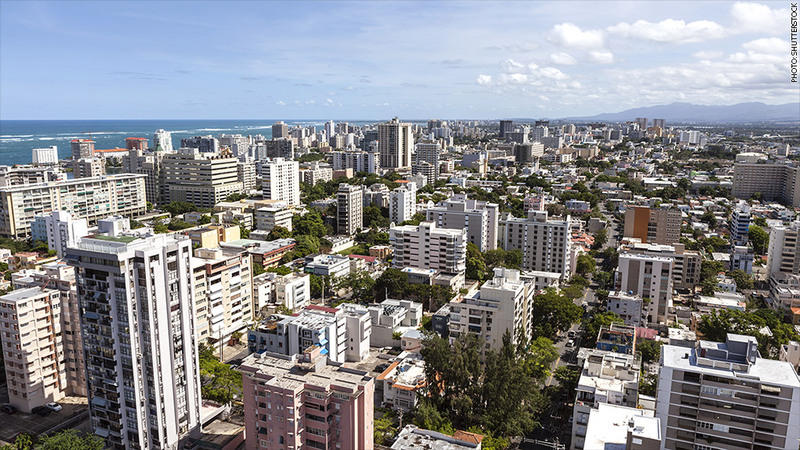 Not only is a desirable holiday spot, but most large pension funds and 401(k) retirement plans own some Puerto Rican bonds. In other words, lots of Americans will be impacted if the payments aren't made. Oppenheimer & Co. and Franklin Templeton, two big firms that get lots of their dollars from mom-and-pop investors, sued Puerto Rico in federal court this week in an effort to get the law overturned. Both firms declined to comment. In court filings, they revealed that they collectively own more than $1.7 billion in Puerto Rico power company bonds alone. The Isle of Enchantment's economy has been in rough shape for a while. Its unemployment rate is 13.8%, and the lowest rate its had in last two decades has been 9.7% (back in 2000). Compare that to the U.S. unemployment rate, which peaked at 10.1% during the recession. It's also facing population decline and a shirking tax base. What happens now? Puerto Rico is in a weird legal spot. Since it's a territory, it's been able to issue so-called "triple tax-exempt" debt, where interest payments aren't taxed on the local, state or federal level. That's a boon for bond investors because it amplifies the benefits of high yields. The 20-year bonds it issued in March initially sold at an 8.7% yield, whereas the equivalent Treasury bond yielded 3.34% at the time. Related: Where else are investors hunting for yield? But Puerto Rico isn't a state and it isn't a country, which limits its options if things go sour. It can't enter bankruptcy like Detroit, and it can't claim sovereign immunity to wave off investors like Argentina. The territory almost ran out of money a few months ago, but it managed to sell a few more bonds to give itself time, but things are shaky again. The question remains how they could even default. "I think a lot of people couldn't get their arms around how they would do that," said Peter Hayes, Head of the Municipal Bonds Group at BlackRock, which owns some Puerto Rico bonds. And the new law only make things dicier, he said. "It brings into question this willingness to pay. Is this the first of many restructurings to come?" Hayes wondered.